Today, March 27, 2019, political prisoners and former public sector organizers Oliver and Rowena Rosales, will again face the trumped-up charges of illegal possession of firearms and explosives filed against them in the Regional Trial Court Branch 19 in Malolos, Bulacan. Rowena and Oliver Rosales, former officers and organizers of the Confederation for Unity, Recognition and Advancement of Government Employees (COURAGE), were illegally arrested on August 11, 2018 while on their way home from the public market. 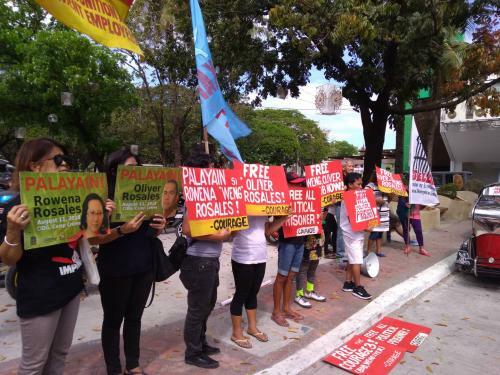 Karapatan has linked their arrest to the Duterte government’s worsening legal offensive against activists and political dissenters, heightened by the creation of the Inter-Agency Committee on Legal Action (IACLA) in October 2017. “IACLA has been instrumental in the political persecution of activists and human rights defenders, subverting the law to criminalize the people’s exercise of their civil and political rights. Trumped-up criminal charges have been increasingly used against individuals critical of the government, with fabricated evidence and perjured testimonies being presented in court. Such is the case of the Rosaleses and all political prisoners. The false allegations hurled against them are with a pretense of legality, but that which ultimately reveals a systematic and intensified agenda of all-out repression,” said Karapatan deputy secretary general Roneo Clamor. The Rosaleses were forcibly taken while onboard their privately-owned tricycle at Galvez St., Brgy. Wawa, Balagtas, Bulacan, and were later taken to Camp Crame, Quezon City. They are now detained separately -- Oliver is at the Special Intensive Care Area-Metro Manila District Jail (SICA-MMDJ) while Rowena is at the Taguig City Jail Female Dormitory in Camp Bagong Diwa. Rowena was shown a warrant of arrest for trumped-up charges of illegal possession of firearms and explosives, the same warrant used against Courage member Juan Alexander Reyes on June 2, 2018. Clamor explained that the Duterte government is continuously subverting the law by using legal processes to commit injustices. “This is an act of reprisal, and an attempt to undermine the legitimacy of the demands raised by activists and human rights defenders. Upon closer scrutiny, political prisoners have been advocating for the people’s fundamental rights and freedoms which are necessary for all to live a life of dignity, including living wages. The Rosaleses have fought for a living and decent wage for workers, the right to unionize and other worker’s rights,” he added. Clamor also detailed that police did not follow proper procedure during their arrest, as arresting officers did not inform the couple of their rights under RA 7438. The police are also building up the scenario that the couple were both carrying firearms and explosives to the market, as their storyline narrates that alleged firearms and explosives were “seized” from the Rosaleses while on their way home from the public market. Furthermore, the “evidence” of the charge against them were only photographed inside Camp Crame, and not at the scene of the crime. “It is also important to emphasize that the Rosales couple were already previously subjected to surveillance. In fact, in August 2015, Courage members, including the Rosaleses, filed a writ of amparo before the Supreme Court, seeking protection after a series of threats and surveillance against the union’s members. The Court gave due course to the petition,” Clamor said. Clamor said that the Rosales couple also had to leave their two children to the care of their relatives. “They are now in separate detention facilities, and are only given a chance to see each other during court hearings. This trumped-up charges against the Rosaleses have not only falsely imprisoned two courageous advocates, but have done irreparable damage to their children and to their family life,” he further added. “We repeat what we have said time and again: political prisoners should be released because the charges against them are patently false and manufactured. This violates the people’s right to organize and their freedom of association. The use of trumped-up charges is a maneuver utilized by avowed fascists to silence dissent. As such, these cases should be immediately dismissed. In light of recent events, we also reiterate our call to resume the peace talks and to end the political persecution against activists, human rights defenders and organizations critical of the government’s anti-people policies,” Clamor ended.